Agricultural concrete applications from Cornwall Concrete Pumping. Our ready mixed concrete can be used for a multitude of applications in an agricultural setting. Paving strength ready mix concrete is highly durable for use on paved areas subjected to not only the moving and scraping of farm vehicles and equipment but the elements as well, particularly frost. 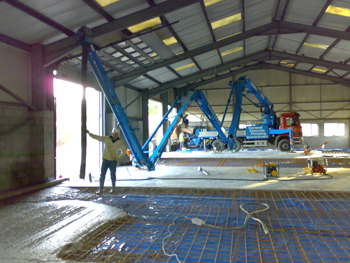 Ready mix load-bearing concrete for internal concrete flooring in storage buildings. With good structural design a hygienic, cleanable and quality finish storage facility can be created with concrete. A specially mixed concrete to meet the demanding standards of hygiene required in livestock housing. It is hard wearing, finished to a high quality, resulting in a non-abrasive and slip resistant surface that is easy to cleaned.